The French musical term Point d’orgue is the equivalent of fermata in English musicology. Its function is to prolong a note or series of notes, thus creating a pause in the tempo. The term itself refers to the capacity of the organ, as an instrument, to hold a note for an unlimited duration. 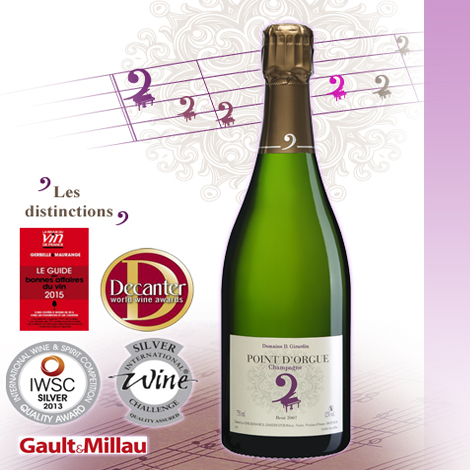 Cuvée Point d’Orgue supends the flow of time, like for the duration of a harvest. Quality naturally depends on this harvest, and time will decide when the wine is ready to be drunk. The 2007 vintage now reveals its vinosity through the leading role played by Pinot Noir. The aromas are rich with notes of pear and honey and the flavours linger on the palate like a note held fermata. The piano is the symbol of the cuvée Point d’Orgue. It illustrates the producer’s solo role in deciding to vintage a year, or not. In this case the producer is herself a pianist. She alone decides the partition of the year.